The Time Delay key interlock is comprised of two lock cylinders, an electronic time delay relay, a solenoid, pushbutton and indicating light. This unit is housed in an aluminum enclosure, suitable indoor environments as well as outdoor environments when equipped with a gasket and protective covers. Please see the associated cut sheet for further details. This device is a two key unit with a primary key position and a secondary key position. 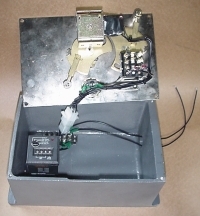 The primary key, after locking related equipment, is inserted and turned in the unit to begin a timer interval. After the pre-set time has elapsed, an indicating lamp illuminates, and by depressing the pushbutton and turning the secondary key it becomes releasable. Removal of the secondary key traps the primary key in place. Premature turning of the primary key resets the timer interval. Loss of power during the timer sequence resets the timer. The secondary key may be taken to related key interlocked equipment. See Capacitor Bank Schemes on our schemes page for a typical application. This unit will prevent operators from entering an enclosure, area, or equipment, which requires time for electricity to discharge, mechanical movement to stop, or process cycle time to end. Some typical examples are capacitor banks, rotating radar dome enclosures, or process control equipment.